Atlanta Tree Damage Repairs, Tree Cleanup From Storms | Paragon Construction, Inc.
Tree damage repairs is a common problem for Atlanta homeowners and you need a professional tree damage repairs contractor. Tree damage can happen due to tornadoes, ice storms, hail, wind, and rain. Insurance restoration companies that immediately address tree damage repairs can often save homeowners hundreds or thousands of dollars in repair costs and decrease the chances of mold growth in your home. At Paragon Construction, insurance restoration from tree damage is one of our core services. We respond to many tree damage emergencies every year. Our tree damage repairs contractors are highly trained in water cleanup and insurance restoration from tree damage . We have a thorough knowledge of the categories and classes of tree damage and how each impacts our response. We use the latest technology and equipment in water extraction and water damage insurance restoration from tree damage. Using proven science to identify the extent of the water damage and to verify drying results, we can further ensure that rooms, carpet, furniture and other household contents are completely dry before we leave your home. 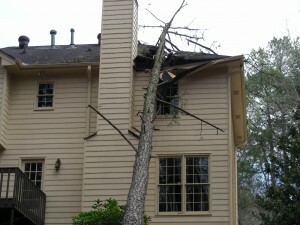 You want your home back to the condition it was in prior to the tree damage as quickly as possible. At Paragon Construction, we know just how to do that. We get your property back to normal faster. Many tree damage repair jobs require little or no demolition and our innovative drying methods means most repairs are completed in a few days instead of weeks. We assist with the insurance claims process. As one of the best tree damage repair and insurance restoration companies, we will work with you to professionally restore your property. If you need tree damage repairs for your Atlanta home, call the tree damage repair and insurance restoration experts at Paragon Construction!